From NY Times and USA Today bestselling author Patricia Loofbourrow ..."... a story that is almost irresistible." SciFi and ScaryKidnapping. Murder. Betrayal.Can you ever truly hide from your past?In a far future US, the once-beautiful domed neo-Victorian city of Bridges is now split between four crime families in an uneasy cease-fire. Social disparity increasing and its steam-driven infrastructure failing, a new faction is on the rise: the Red Dogs.22 year old Jacqueline Spadros was kidnapped from her mother's brothel and sold to the Spadros syndicate ten years ago. The murder of her best friend Air that night as he tried to save her from them haunts her nightmares. Now unwillingly married to one of the city's biggest drug lords, she finds moments of freedom in a small-time private eye business, which she hides in fear of her sadistic father-in-law.Air's little brother disappears off his back porch and the Red Dogs are framed for it. With the help of a mysterious gentleman investigator hired by the Red Dogs to learn the truth, Jacqui pushes her abilities to their limits in hope of rescuing the child before the kidnapper disposes of him.Dark, gritty, multi-layered Victorian-inspired detective neo-noir that keeps the reader guessing to the very end.What readers say about The Jacq of Spades:"... a world of family intrigue combined with feuding households across the four quadrants of Bridges..." June Lorraine Roberts, Murder In Common"This was the first steampunk book that I've read that I actually really loved." Gabby's Honest Book Reviews"... an intriguing and compelling read ..." Diana Johnson"... a first-rate mystery." Clabe Polk Mystery & Adventure"For rich pageantry and a complex culture navigated by a character who feels she's balanced on the edge between the slums of the Pot and the extravagance of the families, The Jacq of Spades is a hands-down success." Margaret Fisk, Tales To Tide You Over"Mobsters, corrupt police and a novice private detective. This story was amazing." Allie's Opinions"... good read for anyone who likes mystery and suspense mixed with science fiction." 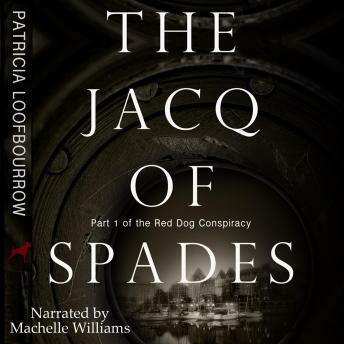 The Beautyful WordLovers of Downton Abbey, Game of Thrones, Phillip Marlowe, or the Sherlock Holmes mysteries will enjoy this debut novel of the Red Dog Conspiracy series.The Jacq of Spades was part of the first edition of the Dark Humanity science fiction and fantasy box set, which made #8 on the USA Today bestseller list for February 5, 2017, and #5 on the NY Times bestseller list for February 12, 2017.Over 19|000 copies of The Jacq of Spades have been sold!Welcome to the Family. There’s a lot going on in this book, maybe too much. Jacqueline (Jacqui) Spadros is married to Tony Spadros, the son of one of the ruling families of Bridges. She herself comes from the poor, the ‘Pot’. Jacqui has some sort of private detective business going on on the side, very secret. Then there’s a dangerous illegal drug, Party Time, going around. Plus there’s a missing boy. Then there’s the whole setting. Basically, I was intrigued by it all but had little time to figure one thing out before something else was thrown at me. The setting kept throwing me for a loop. It feels little historical, a little steampunky, a little dystopian. I like all those things but never got a firm grasp on what the domed city of Bridges was all about. Plenty of the characters held my interest. Of course, Jacqui is front and center. Now the tale does jump back and forth a bit, telling me in small snippets about Jacqui’s past. However, this confused me sometimes as to what was going on in the present. Jacqui has had all this training from Tony’s dad before she and Tony were married – everything from dressing like a lady to hand guns. She and Tony have been married for 3 years and it’s sometimes been good and sometimes not. I would have liked this story more if we had seen Jacqui in action more instead of simply being told what she can do. There’s Jacqui’s contacts and friends and family that are still in the Pot that add flavor to the tale. Her husband Tony isn’t as limited as he first appears to be. Tony’s dad is a right jerk and I look forward to seeing his demise (I hope) later in the series. Though I still feel like I missed something when it came to him lashing out at Jacqui’s maids. Jacqui’s secret private eye stuff felt over the top. We already have a lot going on in the story and then we toss this in. Jacqui references previous cases she’s solved but I kept wondering how she managed to do that plus keep it secret plus all the training she does for Family Spadros plus just being a lady, etc. I hope this side of her character gets filled out as the series goes forward. So all together, I wanted more from the story by trimming things down. I did enjoy it and I look forward to seeing where the series goes from here. 3.5/5 stars. The Narration: Machelle Williams was OK as the narrator. Her pacing is a bit slow. She does have a good voice for Jacqui. Her female voices were good but her male character voices were sometimes OK and sometimes they sounded like women. There were plenty of emotions in this story and sometimes Williams portrayed them well and sometimes her narration was a little stiff and dead. 3.5/5 stars.